The city has over 835,000 inhabitants. Located in the southwest of Spain, Seville is the capital of the Autonomous Region of Andalusia. This modern city has an extremely rich history which dates back over two and a half thousand years. Seville has its own international airport, and has convenient transport links with the rest of Spain. Seville enjoys a Mediterranean climate, where summers are hot and winters are mild. The south coast of Spain isn't too far from the city centre, with students enjoying day trips to the beach in the summer. Seville enjoys a rich history, still present in the architecture and grandeur of the city, as well as a modernity that makes Seville an exciting place to be. The city's cathedral, the alcázar, the Giralda, the Barrio Santa Cruz and the Torre de Oro are beautiful remnants of Seville's cultural heritage, and are well worth visiting. Seville has a world famous Semana Santa (Easter Holy Week), full of processions and customs, and is also home to the Feria de Abril, Spain's most famous Flamenco event. 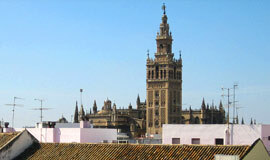 Seville is known as the world centre for flamenco music and bullfighting. Seville has one of Spain's highest concentrations of bars, meaning you won't have to go far to enjoy a night out here! Travel from Madrid to Seville only takes two and a half hours on the high-speed AVE train. Seville also has great transport links with the rest of Spain, as well as the rest of the world, thanks to its international airport. As the capital of Andalusia, Seville is home to the Andalusia region's parliament (Regional Government). Almost half the population of the province lives here. 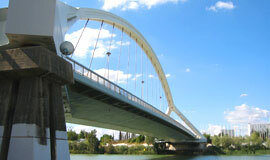 Seville is also Spain's fourth largest city after Madrid, Barcelona and Valencia. The city sits on the Guadalquivir River, and it was an important port city in Colonial-era Spain. Seville is still one of the country's busiest river ports. While ancient mythology claims Heracles founded the city, we know that the Romans had a settlement here, which they called Hispalis. The people of Seville are still sometimes called hispalenses, after this Roman name. A temple in Mármoles Street is also a remnant from this era. After the Visogothic period, Seville was conquered by the Moors, Muslims from Northern Africa, in the year 712. Moorish influences in the city can still be seen in contemporary Seville, in city walls and in stunning monuments such as the Alcázar and in the Giralda, the bell tower of Seville's beautiful Cathedral. 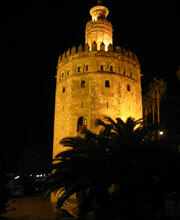 In 1248, King Fernando III's forces took over the region, and Seville has played an important role in Spain since then. Seville was the only port awarded the royal monopoly for trade with the growing Spanish colonies in the Americas, and therefore it prospered financially during what we now call the Golden Age. In the 19th and 20th centuries, Andalusia experienced industralisation and urbanisation, turning Seville into the exciting city it is today. Seville's university was founded in 1505, and the city enjoys a vibrant atmosphere thanks to its large student population. Visitors, students and locals alike enjoy Seville's wonderful tapas. The city features over thousand bars, where food options seem unlimited. Many Sevillians even make a meal of just tapas, trying one dish at a time, moving from one bar to another. Semana Santa is Spain's famous Holy Week, and is celebrated over Easter. During this time, the 'Cofradí­as' (religious brotherhoods), along with thousands of other residents and visitors, march in penitence throughout the streets of Seville. They wear capirotes or conical hats, to hide their faces during their penance. The cofradías move floats as they march, which offer the crowds of observers images representing the stages of Jesus' death and resurrection. Preparations for Seville's April Fair, La Feria de Abril, begin straight after Semana Santa. This festival is famous around the world for showing off the Sevillano party spirit. Thousands of temporary bars are set up in the form of casetas (tents), which are illuminated by lights and lanterns and embellished with festive decor. Judges later pick the most impressive caseta and offer it a prize.